The other day a friend of mine said, "Seeing Borders go Titanic has to make you happy." He was the fourth or fifth person to make a statement along those lines within a week and it really made me think. And the answer is: No, it doesn't bring me any happiness. The reasons for that are many and complex and murky--even to myself--but here's some of it. One, a lot of people will lose their jobs. People at Borders. People at publishers and distributors that Borders doesn't pay. Just last week B&N laid off some of their most experienced staff. One day they report great holiday sales and a strong fiscal quarter. The next they axe the regional buyers. The people who know the difference between the Roseville store and the Galeria. The kind of people who gave those stores a little different look and feel. Now, more than ever, a B&N store in Phoenix will look like Tulsa will look like Baltimore will look like Sioux Falls. That, on a book level, disappoints me as well. Whether in Shelf Awareness, Publishers Weekly or any of the legions of lit blogs we get more bad news every day about the chains. They are closing distribution centers. The Upper West Side Manhattan B&N is closing. The Nook info center in each store will be in place of 1,000 sq. feet of primo book display real estate. They're saying, in essence, "Hey! Let us help you buy something that will allow you to never shop here again." It's lunacy and if they think they can do battle with Amazon and Apple I have some bad news for them. Amazon will out-discount you and sell you a box of pancake mix and a pair of corduroy pants with a smile before showing you the door. 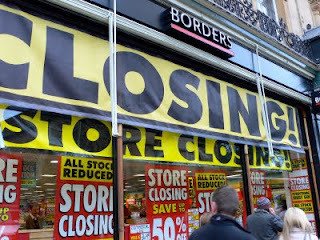 Because it was the indie stores 15-20 years ago that tried to compete with the chains in discounting that closed first. You show me an indie that discounts heavy, other than Powells, and I'll be shocked. You don't win playing the same game. Just today B&N advertised their deal with Groupon. For $10 the customer gets a $20 certificate. Of the $10 paid Groupon gets half and the store gets half. So I joked to Tom that we should have everyone we know buy one and then we could use them to do a backlist buy, in effect, with them. But that was just a joke. If I was a more cunning business man it would be serious. The trouble they are facing is one of scale and a model that never really was sustainable. Most, if not all, of the problems that plague the book industry are related to this. Why do so many books get remaindered? Because publishers, even small ones, are forced to print too many books in order to get good display or review attention. A really radical idea would be for a publisher to say, "We're going to print less. We'll re-print quickly, if needed, but we want to be realistic." They might even make money. Returns policies? They are, absolutely, as is because they are necessary for the chains to have stacks of fifty copies of every celebrity book out there. Because to actually pay for those piles--that would be tough. I, for one, would love to see the end of returns. Would it challenge us? Would it make us really think about the difference between 2-5 books? Yeah, it would. But it would also level the playing field quickly. Buy what you want and sell it for what you can. It's real American enterprise. I'd love to sell books like the Gap sells t-shirts. The book business is sick and everyone in it is feeling it in some form. Long ago I gave up hating the chains because it didn't do me or anyone else any good. I didn't want to be one of those 'High-Fidelity'-esque guys. It's ugly. So I don't look forward to a day when I read about Borders closing or declaring bankrupcty(which, depending on who you listen to, is coming any day. Or not at all.) I don't want more people to lose their jobs. About 1% of people who work in books are in it for the money and the rest of us are all here for the same reason and that reason is our love of books and reading. That's me, the guy working at the anarchist book collective and the semi-retired woman working at Borders. I don't want my friends who work for and run small publishers to get stuck holding a bill that is never going to be paid. I guess I need to finish this by answering a question from a customer and from another bookseller. Yes, it is Hans that writes the blog. Just wanted to note that not all of my co-workers agree with me all of the time and that all of the above is just my opinions. Nothing more. And the photo is from somewhere in the UK. It's refreshing to read that someone out there would like to do away with returns; too bad it's not the publishers (the big publishers). Here's another idea that publishers seem to never consider: it's way past time to dump the hardcover format. How can bricks-and-mortar stores possibly compete against e-books on price if hardcovers are still clogging up the stream starting at $24.95? It's insane. Who cares if a book is only issued in paper anymore? The reading public sure doesn't. I believe it's actually a fundamental reason why e-books are so attractive. European publishers figured this out decades ago. I think indies should stand up and demand an end to the format. That kind of move would seriously challenge the discounting war also. Thanks for a great piece, Hans.